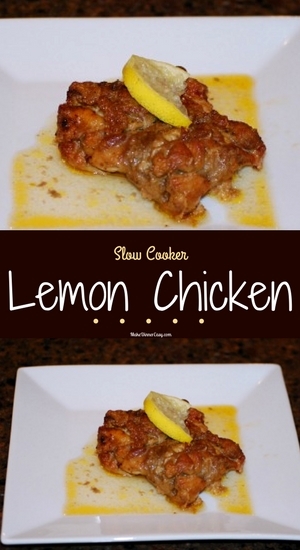 This recipe for Slow Cooker Lemon Chicken is light enough that you can even make it during warm weather. 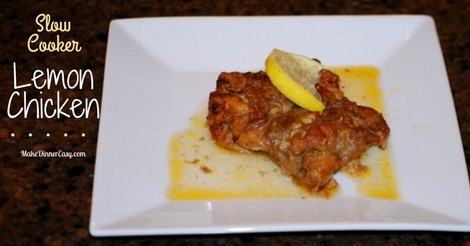 Many lemon chicken recipes call for white wine and a lot of lemon juice. I've made this kid friendly by substituting chicken broth for the white wine and going easy on the lemon juice. Taking the time to brown the chicken breasts will yield an attractive chicken dish that won't even look like it has been cooked in a slow cooker. Coarsely dice the onion (big chunks). Place the diced onion in the bottom of a slow cooker. Combine the flour, paprika, 1 teaspoon of salt, oregano, and garlic powder in a pie plate or medium bowl. Set the flour mixture aside. Heat the butter and olive oil in a large skillet over medium heat (keep the heat low enough so that the butter doesn’t burn or brown). Dredge both sides of each chicken breast in the flour mixture and place the chicken in the hot skillet. Brown each side of the chicken breasts (may take 3-5 minutes per side). Place the browned breasts on top of the onions in the slow cooker. Using the same pan that you browned the chicken in (don’t wipe it out! ), pour the lemon juice and chicken broth into the pan and heat over medium-low heat. Add the remaining ½ teaspoon of salt and stir for about 1 minute. Pour this liquid over the chicken breasts. Cover and cook on low for 7-8 hours. Serve over rice or pasta.